In an age of supermarkets and online commerce, markets offer unique social and cultural opportunities and bring together urban and rural worldviews. While often overlooked in traditional economic studies of food distribution, anthropologist Rachel Black contends that social relations are essential for building and maintaining valuable links between production and consumption. Porta Palazzo, arguably Western Europe’s largest open-air market, is a central economic, social, and cultural hub for Italians and migrants in the city of Turin. From the history of Porta Palazzo to the current growing pains of the market, this book concentrates on points where trade meets cultural identities and cuisine. Its detailed and perceptive portraits of the market bring into relief the lives of the vendors, shoppers, and passersby. Black’s ethnography illuminates the daily work of market-going and the anxieties of shoppers as they navigate the market. 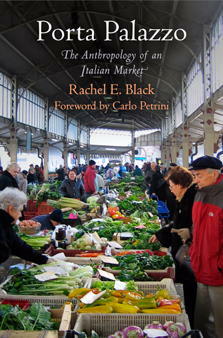 It examines migration, the link between cuisine and cultural identity, culinary tourism, the connection between the farmers’ market and the production of local food, and the urban planning issues negotiated by the city of Turin and market users during a recent renovation. This vibrant study, featuring a foreword by Slow Food Movement founder Carlo Petrini, makes a strong case for why markets like Porta Palazzo are critical for fostering culinary culture and social life in cities.